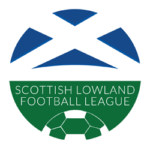 BSC Glasgow spoiled East Kilbride’s title party with a stunning injury time comeback which also saw them secure second place in the Lowland League table for the season. The first half was a scrappy affair, with the visitors having the better of the chances. On loan St Johnstone winger Euan O’Reilly shone for much of the game, and saw his low drive strike the post after a good run into the box on the right hand side. But against the run of play East Kilbride took the lead shortly before the half an hour mark when Chris Humphrey lashed in a brilliant free kick into the top corner from the edge of the area. The hosts began to find their rhythm in the second half and were guilty of wasting chances to put the game to bed. On 57 minutes, right back Scott Stevenson broke into the box but was denied by BSC keeper Ryan Marshall, before Jamie Longworth missed two good chances. The visitors grew into the game again in the last quarter, and Martin Grehan saw a header from a Hughes free kick rattle the crossbar before being scrambled away by the EK defence. 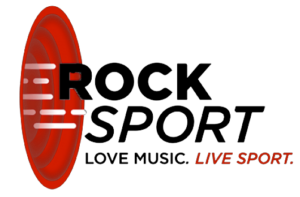 Their pressure finally took its toll as the match went deep into injury time, following a serious injury to EK’s David Proctor. Substitute Jamie McCormack equalised for BSC with a bullet header from a Hughes corner before defender Scott Mills clinched all three points for his side right at the death, side-footing high into the goal via the underside of the crossbar. 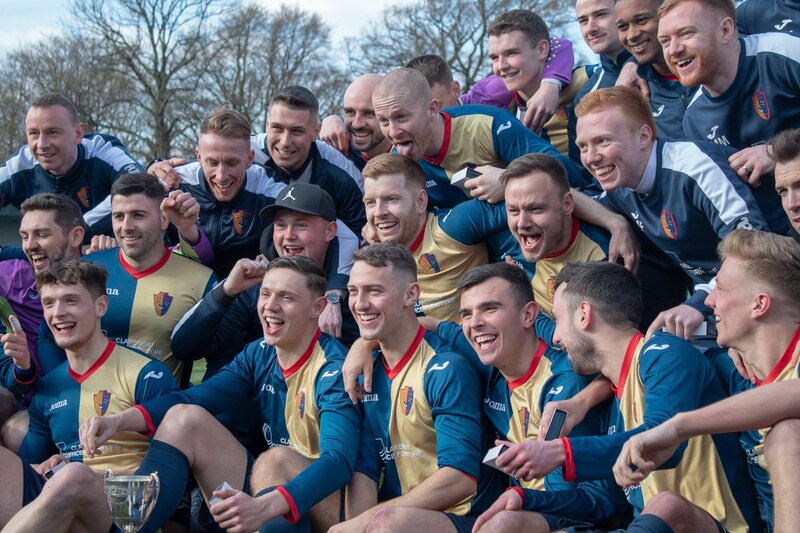 Despite the result EK manager praised his players, as they celebrated wining their second Lowland league title in as many years. An 89th minute strike from Dean Watson was enough for Gretna 2008 to take all three points at the Forthbank Stadium against the University of Stirling. A goalless first half erupted into life in the final 15 minutes in Stirling. Kevin Connelly put the visitors ahead on the 76th minute but the students fought back when Euan Baird fired home from close range after Blair Lyon’s flashed a ball across the face of goal with four minutes remaining. There was still time for Gretna to bounce back and with a minute left of the ninety as Watson put Gretna back ahead and the visitors held on to secure all three points. Victory moves Gretna above Stirling University with the both sides having a chance of finishing in the top ten next weekend. Dalbeattie Star’s good run of form came to an end as Gala Fairydean Rovers won a five goal thriller at Netherdale. Scullion gave the home side an early lead after only seven minutes before a frantic finale to the first half. Ruari Paton doubled the hosts lead two minutes before the break but Lewis Todd brought one back for Star on the stroke of half time. The visitors got their equaliser with twenty minutes to go to complete there comeback through Ross Thomson but Paton secured all three points for Gala with his second of the game fourteen minutes from the end. Gala are up to ninth going into the final round of fixtures next Sunday while Dalbeattie are now confirmed to finish fourteenth. Matthew Flynn took his goal tally into double figures for the season with a match winning strike for Edusport Academy at Ferguson Park on Saturday. The victory keeps Edusport in eighth place, two points ahead of Gala Fairydean Rovers as Whitehill remain rooted to the foot of the table. There was controversy towards the final whistle as the visitors were reduced to 10 men. However, their three points makes it back-to-back victories and consecutive clean sheets for keeper Solal Permard-Bassi. As for Ian Little’s side, they remain 12 points adrift of second bottom Dalbeattie Star and the former Berwick Rangers boss has one more opportunity to collect three points in the league with a trip to Edinburgh University next Saturday. Dorian Ogunro’s Edinburgh University hit Vale of Leithen for six in an eye-catching victory for the students on Saturday. Remarkably, the match was goalless at half-time but the visitors ran away with the match during the second period. The first goal didn’t arrive until the 67th minute. Greg Swan grabbed the headlines as he bagged a hat-trick in his last match for the club so will bow out in style. Aidan Kemp got his name on the scoresheet as well as left back Max Condie. Santeri Kuivalainen netted his third of the season to wrap up a breathtaking second half from the visitors. It has saw Vale go from recording arguably their best result in the Lowland League with a 5-0 demolition of Cumbernauld Colts, to then collect arguable their worst result this weekend. It was however difficult circumstances for Vale of they lost their goalkeeper Mark Wilson through u=injury after 50 minutes meaning manager Chris Anderson had to fill in between the sticks and Vale played the remainder of the match with 10 men. The result sees Edinburgh Uni rise to tenth in the table above Vale who now sit 13th in what has turned out to be an extremely unpredictable bottom half of the table. 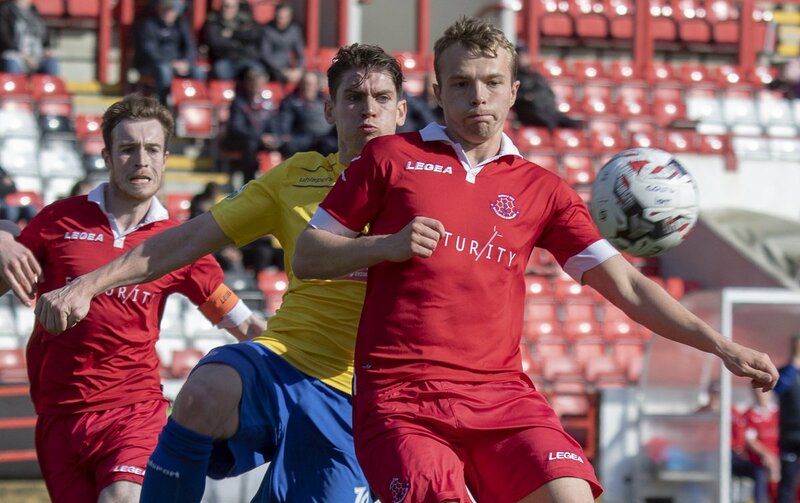 Sixth place East Stirlingshire were able to hold last year’s Lowland League champions to a vital draw at The Falkirk Stadium leaving Spartans hope of finishing in the top four even slimmer. The first half saw very little to write home about with neither side really grasping at proper opportunities. It wasn’t until the 72nd minute the opening goal finally occurred thanks to Andy Rodgers slotting it in from the penalty spot. The Edinburgh side managed to get back into it with ten minutes remaining due to a defensive error by Shire’s Steven Smith which allowed Blair Atkinson to put the ball home and secure a point. Both sides remain in the positions they went in with, so it all comes down to their final games next week if either side want to bag a higher finish. Cumbernauld Colts bounced back from last weekend’s horror 5-0 defeat to Vale of Leithen with a comprehensive 3-0 victory over high-flying Civil Service Strollers. Colts opened the scoring on 17 minutes as Sean Brown was brought down in the box and Craig Holmes tucked the resulting spot kick away. On 63 minutes it was a carbon copy of what happened in the first period as Holmes netted his brace with Brown again going down inside the area. Three minutes later, Brown marked his return from injury with a goal for himself, taking his tally to eight for the league campaign so far. This was Strollers last match of the league season. They will be disappointed with how it finished for them, but they can certainly be proud of what they’ve achieved under Gary Jardine. They now need to rely on Spartans losing to Cumbernauld on the final day to secure their place in the top four. The victory for Colts has put them level on points with East Stirlingshire but remain behind the sixth place side on goal difference.